Pop yo' collar! Was it Kanye West who suggested we all do that? I know the Becks family were one of the first to start doing it publicly being British and all but it was Kanye who actually made a song about a collar. LOL (sounds so shallow after re-reading it.)! I might make myself several million writing about hems instead! Okay enough about collars. I just find it fascinating that something as simple as popping a collar could have such a drastic change in the look of your over-all outfit. It makes an outfit look instantly "smarter" and chic-er! 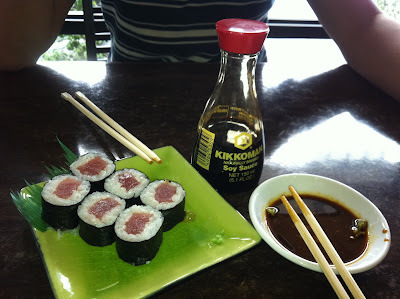 Tekka Makki...one of my favorite things in the world to eat! as always, I'm so in love with your skirt! I think you should go back for the dress. It looks really good on you! you can buy a similar shorts from an online shop. 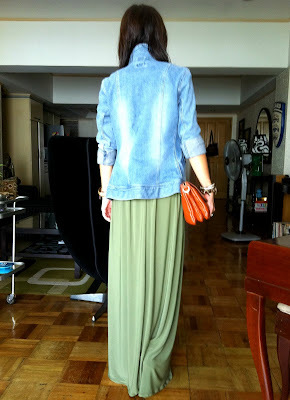 i think it cost around 600 :] Im inlove with that kind of shorts too! 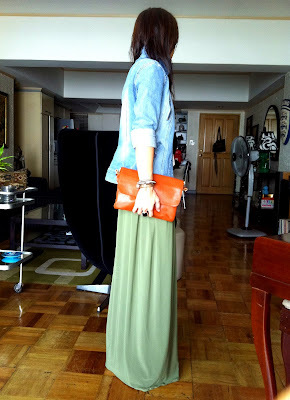 maxi skirts are so in style right now :) Looking cute and chic! I say, buy that dress! It's gorg! I'm gonna start poppin' my collar ! You are such an entertaining writer! I love how your character comes through. This is an awesome post, so funny too! And really, I love the look. LOVE it! You've totally sold me and i'm your 714th follower!! Wow! Impressive numbers to a baby blogger like myself. btw, thank you for popping over and commenting. It means the world to me. Truly. ps. Go buy that dress. It's BEAUTIFUL! i love the white dress! hehehe... you definitely aren't afraid of color huh? i love it (referring to your first photo). i totally agree...the flip of the collar makes a huge diference! denim jackets are so perfect with evvrything! love it with your maxi! Gorgeous skirt. I wish I could pull of this look and not look like an idiot lol! Oh wow, that long green skirt looks amazing on you! Thanks so much for your lovely comment! Your blog is awesome! I love this white dress! I need it! Is that maxiskirt one of your DIY's? u look great in that outfit! It is totally true about popping your collar, it makes u look chic-er! im gonna try it from now on! Buy the dress! it's really beautiful. it's a classic. and i love the color of your skirt. so nice. Buy the dress!! :)) Anyway, I love your skirt!! Check out my blog babe! A lot of people don't like popped collars, but I think it only bothers me if it's polos. I love it on denim jackets. I think it's hot!